How do you guys feel about Eggplant?! I feel like it is one of those vegetables that people fall in loooove with once they’ve had it prepared the right way. Y’all know that I LOVE Eggplant (or aubergine to my friends in the UK). It’s the main ingredient used in my Vegetarian Bolognese and I used it again a couple weeks ago in my Summer Ratatouille. 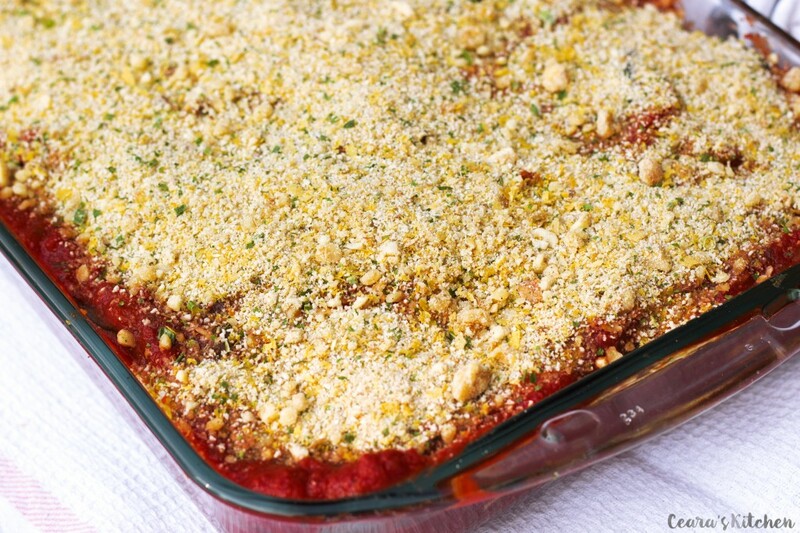 If you hadn’t already guessed, eggplant is the STAR ingredient in this Vegan Eggplant Parmesan! Hearty, meaty, crispy and lightly breaded eggplant layered in between a simple basil-tomato sauce and topped off with some mo’ cheesy-herbed-breading on top. It’s all about the flavorful and crispy breading on top, amiright?! This Vegan Eggplant Parmesan is definitively a weekend kind of meal. The *secret* of this recipe is in how the eggplant is prepared. If your eggplant is prepared the wrong way (aka you leave these steps out!) you will have a mushy Eggplant Parmesan. We don’t want that. The couple of extra steps of prep at the beginning are well worth it in the final results. I salt and set aside the eggplant rounds for an hour or so while preparing and simmering the basil-tomato sauce. This step allows the extra moisture to release from the eggplant. I then bread the eggplant in a herb and breadcrumb mixture before broiling it and assembling everything together in the pan. These two extra steps help the eggplant to get nice and crispy. 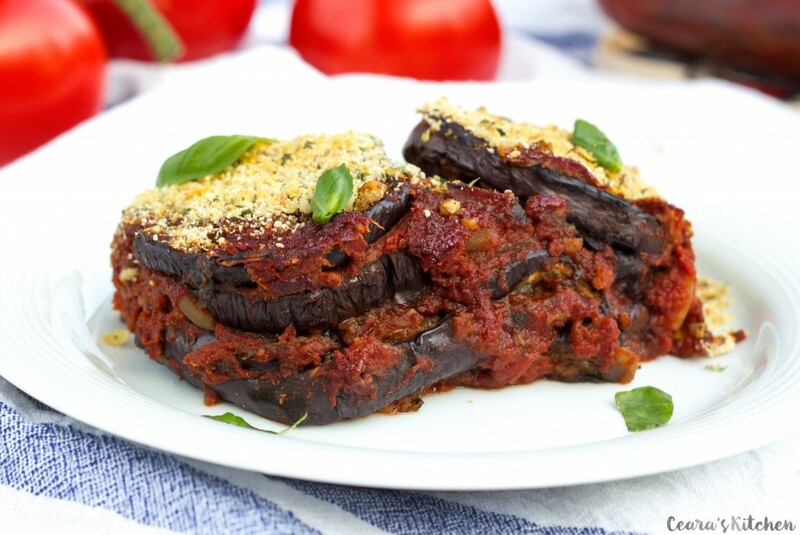 You can assure that there is only hearty, thick and meaty eggplant in sight of this Healthy Eggplant Parmesan! I love serving this mouth-watering Eggplant Parmesan fresh from the oven on a bed of fresh fettucine pasta! YUM. 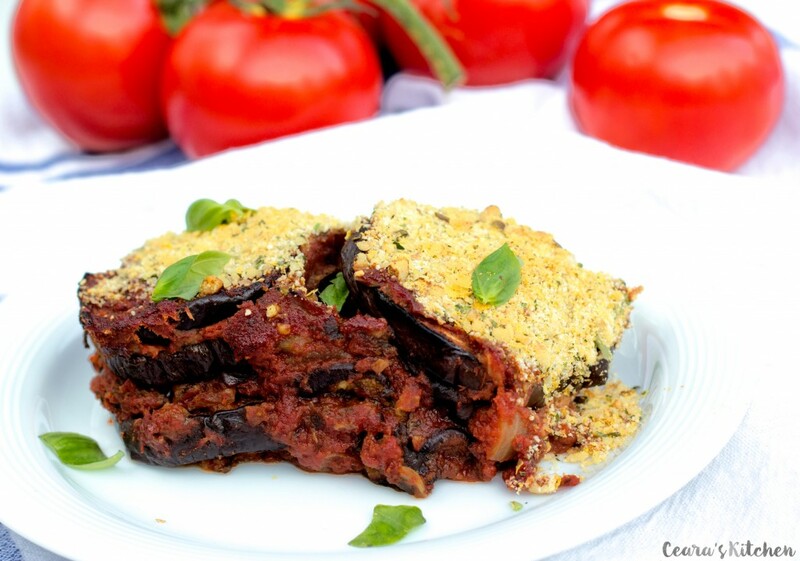 This Vegan Eggplant Parmsan is so incredibly hearty and flavorful. 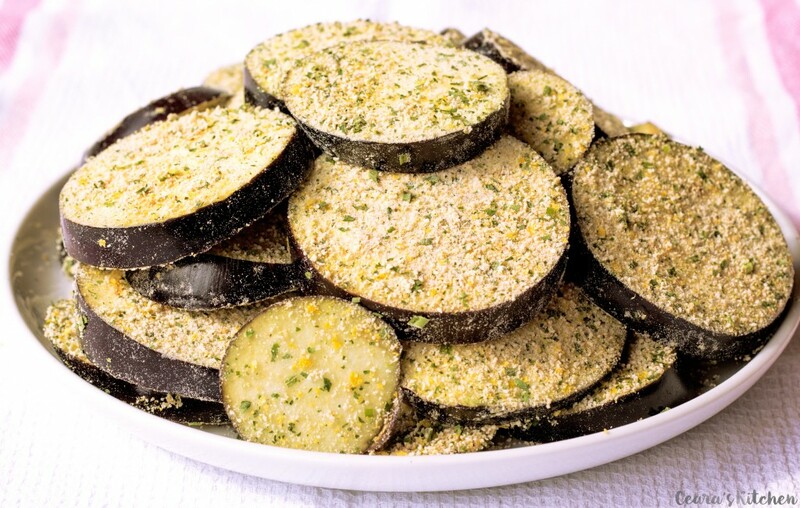 The eggplant is sprinkled with salt and breaded prior to assembling the Eggplant Parmesan to ensure that the eggplant stays crispy and firm while baking. 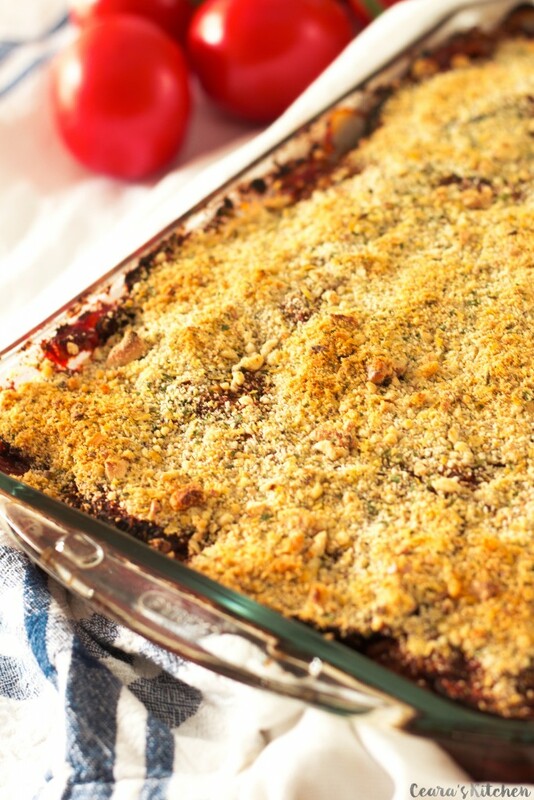 I love serving this Eggplant Parmesan over a bed of fettucine pasta fresh from the oven. [b]Prepare Eggplant:[/b] Chop the eggplant in 1/2 inch rounds. Place on a baking sheet with paper towel underneath and sprinkle with sea salt. Set aside for 1-2 hours. This allows the moisture to release from the eggplant rounds and helps everything to get nice and crispy in the oven. Prepare the breadcrumb mixture and the tomato sauce while the eggplant is sitting. [b]Tomato Sauce:[/b] Over medium high heat, in a large pot, saute white onions, garlic, herbes de provence and red pepper flakes in a splash of vegetable broth until the onions are soft. Add the tomato sauce, Stir. Add the fresh basil, cane sugar and balsamic vinegar. Stir. Cover and leave to simmer on a low high for 30 minutes to an hour, stirring every so often. [b]Breading and Roasting the Eggplant: [/b]Pre-heat oven to broil. Line a baking sheet with parchment paper. After the eggplant has sat with the salt for an hour or so, pat it lightly with a cloth (but don’t pat all the moisture off – this with help the breadcrumb mixture stick to the eggplant rounds). Toss the eggplant rounds in the breadcrumb mixture. Press the breadcrumbs onto the eggplant and place on the baking sheet. Broil the eggplant for 4 – 6 minutes on each side (watching closely to see that they do not burn!). The eggplant should be browned and slightly crispy when it comes out of the oven. [b]Assemble:[/b] In a 9 x 13 casserole dish, spread 1/2 cup of the tomato sauce on the bottom of the dish. Place a single layer of breaded eggplant on top of the tomato sauce. Spread another layer of 1/2 cup of tomato sauce on top of the eggplant so the eggplant is fully covered in tomato sauce (you may have to use a bit more tomato sauce). Place another layer of breaded eggplant in a single layer, spread tomato sauce on top. Continue until all your eggplant and tomato sauce is used up and your casserole dish is full with a thick layer of tomato sauce on top. I had four layers of eggplant in my casserole dish. [b]Prepare the Topping: [/b]Mix together 1/2 cup of the breadcrumb mixture (reserved from before), 1/2 cup of blended cashews and 3 tbsp of nutritional yeast. Sprinkle on top of the Eggplant Parmesan. [b]Bake:[/b] Turn the heat of the oven down to 355F/180C. Place the casserole dish in the oven uncovered and bake for 30-35 minutes until the tomato sauce is bubbling on the side and the the top is slightly brown. Serve with fettuccine and garnish with fresh basil. 1) Use blended sunflower seeds for a nut-free option or leave the cashews out of the topping altogether. [br]2) Replace blended cashews with walnuts or pine nuts. [br]3) Use gluten free breadcrumbs if you need this recipe to be gluten free. i don’t see a reply to the question of if you can make ahead and freeze. Please let me know. Not a comment well except looks wonderful and healthy but I have a question do you think I could make on a Thursday and freeze for reheat on Sunday for a party? 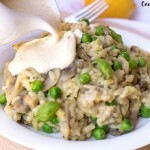 I absolutely love this recipe Ceara! I’m a huge fan of eggplant but I always struggled with preparing it without having it swim in oil. 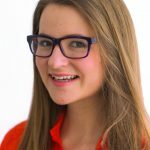 Thanks for you amazing tips! This is my favourite way to eat aubergine. It is just so comforting and perfect for Autumn coming up soon. Sounds wonderful! Love eggplants. 🙂 It’s great that you roast the eggplant slices in the oven – saves tons of time and is healthier, too! This looks incredible! I love eggplant and have tons of it growing in my garden right now. Love that herby breadcrumb topping!! Jealous of all the eggplant growing in your garden! 😉 😀 Thanks, Jenn!!! This is sooo beautiful Ceara!! I’m in love with it and that topping is gorgeous. Your recipes always amaze me, they are so delicious and simple and so flavorful. My husband loves eggplant and I bet he would die over this! Teach me your ways woman, haha! !